Two West Belfast natives are set to lead one of the United States’ most popular St Patrick’s Day parades. Seamus McCaffrey and Lucy Artt have been selected to take on the key roles of Grand Marshall and Queen of the March in Phoenix, Arizona on March 17. Seamus, who has been living in the desert city for 30 years, is originally from the lower Falls. Lucy was born in Andersonstown but moved to the US with her parents when she was a little girl. The pair will be proudly decked in green next Saturday as they lead some 30,000 revellers in the celebrated 29th Annual Phoenix St Patrick’s Day Parade & Faire. “For the Grand Marshall and the Queen of the March to be from West Belfast is a one-off – you wouldn’t bet on that in Vegas,” laughed Seamus. “I have been here for 30 years and there’s a great Belfast community here. In fact, there are people from every corner of Ireland and we are very close-knit. And publican Seamus will welcome a large and happy crowd to his popular Irish pub in the city later that evening to round off the big day. Holder of the dual title of Arizona Colleen and Arizona Rose, Lucy was the obvious choice for Queen of the March. 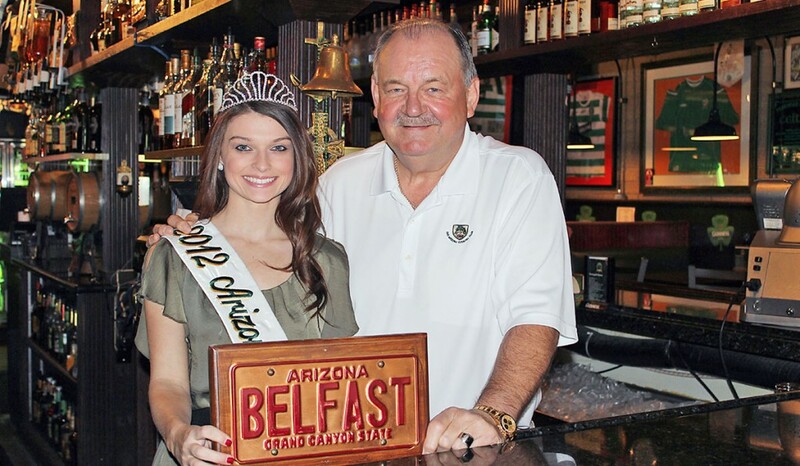 The 23-year-old, from Mesa, Arizona, is an Arizona State University graduate who also works in another Irish pub, D’Arcy McGee’s in Tempe. Lucy will bring her twin titles to the 53rd Annual Rose of Tralee International Festival regional finals in Portlaoise in June this year, when she’ll take the chance to visit family members in Andersonstown.